Nuclear power as a sustainable source of power in the United States is an extremely viable and also extremely controversial subject matter. For these main reasons it is important to know the history associated with the fuel source in order to enhance output; reduce waste; and, most importantly, improve safety standards. Before the turn of the twentieth century scientists were beginning to discover that atoms contained large amounts of energy. Ancient Greek philosophers developed the idea that matter is composed of invisible particles called atoms. The word atom comes from the Greek word, atomos, meaning indivisible. The science of atomic radiation was mainly discovered and developed between the years of 1895 to 1945. The majority of the discoveries leading to nuclear fission and power were implemented between 1939 and 1945. The main reason for the high focus on this science was due to World War II. Within the United States, much of the research began and was developed around the Manhattan Project. The Manhattan Project was a project implemented during wartime for the research and development of the first atomic bombs. The committee informally began in 1939 with letters from Albert Einstein and Leó Szilárd to President Roosevelt concerning the threat of Nazi Germany implementing nuclear weapons against the Allies. In 1942 the US Army took over the Manhattan Project. This greatly impaired the information flow to Britain who was also working on the weapon. Eventually, Roosevelt and Churchill came to an agreement in Quebec in August 1943, in which the British handed over all their reports and research to the United States. This collaboration of information eventually led to the atomic bomb. The nuclear bomb was a precursor of many new improvements to come. Not only as a weapon or threat but as a power source that brings simplicity and ingenuity to a rapidly growing United States nation. After the atomic bombs were dropped and the war was over, the United States government began the encouragement of utilizing nuclear energy for peaceful civilian purposes. President Roosevelt issued the “Atoms for Peace” program; with this motivation, Congress created the Atomic Energy Commission (AEC). The AEC authorized the construction of Experimental Breeder Reactor I in Idaho. The reactor was a success and generated its first electricity on December 20th, 1951. However, this reactor was not commercially viable. The first commercially viable nuclear reactor was located in Shippingport, Pennsylvania, in 1957. After the success of the Shippingport reactor, private industry began to become more involved. The nuclear power began a craze in the nation and nuclear power plants began to flourish throughout the United States. Mainly throughout the eastern coast of the nation. As you can see through the graph, between 1975 and 78 the amount of reactors licensed dropped dramatically due to the rising constructions times and falling fossil fuel prices made nuclear power very unattractive. The Three Mile Island Incident was a great turning point in nuclear power throughout the United States. At 6:56 A.M. on March 28th, 1979 an emergency state was ordered for the Three Mile Island Nuclear Power Plant. This emergency rose due to a stuck open pilot-operated relief valve in the primary system along with human error. This was a contributing factor in the declining construction of nuclear power plants in the United States. There was a incline in construction every year up until 1979. However, along with the low fuel costs and threats of overcapacity, construction from 1980-present of nuclear power plants has been declining. At the time of the Three Mile Island incident there was 129 nuclear power plants approved, of those, only 53 were completed. This incident also led to greater opposition to the industry along with lengthened construction intervals due to higher safety regulations. There are also seven states in which nuclear power makes up for the largest percentage of their electricity generated. 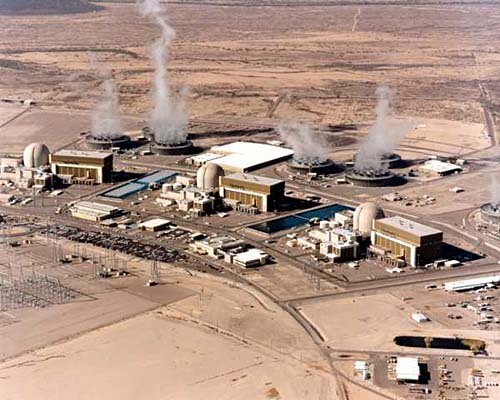 The Palo Verde plant, in Arizona, is the biggest plant in the United States, it contains 3 reactors with individual reactors being able to produce 1,311 MW, 1,314 MW and 1,317 MW for a total of 3,942 MW. See Nuclear Energy Institute's website for more information. The smallest plant in operation in the United States in the Fort Calhoun plant in Nebraska which contains 1 reactor capable of 482 MW. The last nuclear power plant was Watts Bar 1 built in June of 1996 in Tennessee, which produces 1,123 MW. Our nation’s oldest operating nuclear power plant is Oyster Creek in New Jersey which has an operating license issued April 1969. This occurs when a large nucleus with fissile properties absorbs a neutron. The heavy nucleus can split into two or more lighter nuclei, releasing fission products like gamma radiation, free neutrons, and kinetic energy. A portion of these neutrons may be absorbed by other fissile atoms and trigger further fission events, this cycle will continue to occur and is known as a nuclear chain reaction. The reaction can be controlled by using neutron poisons. These will absorb excess neutrons, and neutron moderators, which reduces the velocity of fast neutrons. This increase or decrease of the rate of fission has a corresponding effect on the energy output of the reactor. The reactor is able to generate heat in a number of different ways. The most common way is the kinetic energy of the fission products being converted to thermal energy when their nuclei collide with other atoms. Other ways involve gamma rays that are produced during fission being absorbed and being converted to heat. Radioactive decay also produces heat. This heat source is able to remain some time after the reactor is no longer operating. The coolant for a nuclear reactor is typically water but it can range to things such as a gas or a liquid metal. Whatever the coolant; it is circulated past the reactor core to absorb heat. The heat is carried away from the reactor and is then used to generate steam. The next step in the process varies depending upon whether it is a pressurized water reactor or a boiling water reactor. Both of which will be addressed a little later. The power output of the reactor is controlled by controlling how many neutrons are able to create more fissions. This can be done by several different methods. Control rods are the most common method for this. They are made up of nuclear poisons that are designed to absorb neutrons. Absorbing more neutrons in a control rod means that there are fewer neutrons available to cause fission, so pushing the control rod deeper into the reactor will reduce its power output, and extracting the control rod will increase it. In some reactors the coolant can also act as a moderator for neutrons. It will increase the power of the reactor by causing the fast neutrons that are released from fission to lose energy and become thermal neutrons. The thermal neutrons are more likely to cause fission, so more neutron moderation means more power output from the reactors. Coolants can also acts as a poison by absorbing neutrons in the same way that the control rods do. In these reactors power output can either be decreased or increased based on the temperature. When heated it will make the coolant a less dense poison and vice-versa. During the fission process there are large amounts of heat generated. Much of this heat is able to be converted into usable energy. Typically the method used to harness this thermal energy is to boil water to produce pressurized steam. The steam will then power a steam turbine that in turn will generate electricity. Reactors are typically classified by the type of coolant that they use. In the U.S. there are currently 104 operating reactors. Of these 104; 69 are pressurized water reactors and 35 of them are boiling water reactors. These types of reactors are by far the most common type of Nuclear Reactors in use as of now. In these reactors ordinary water is used as both neutron moderators and coolant. The water is used as moderator and the primary coolant is separate to the water used to generate steam and to drive a turbine. In order to efficiently convert the heat produced by the Nuclear Reaction into electricity, the water that moderates the neutron and cools the fuel elements is contained at pressures 150 times greater than atmospheric pressure. In a Boiling Water Reactor ordinary light water is used as both a moderator and coolant, like the PWR. Where it differs is that in a Boiling Water Reactor there is no separate secondary steam cycle. The water from the reactor is converted into steam and used to directly drive the generator turbine. To produce the electricity in a reactor, it is necessary to split uranium atoms. This uranium used as fuel in a nuclear plant is formed into small ceramic pellets. Fission is then used to release particles of their own. These particles strike other uranium atoms and it results in splitting. During this splitting there are certain changes that take place. The particles that are left over after the atoms have split are very radioactive. Different phases and elements of the process result in different leftovers with different half lives. Some of the common are as follows. Reactors that are finished with production are called spent nuclear reactors (SNF) Radioactive material in SNF falls into 3 categories, un-reacted fuel (usually uranium), fission products, activation products (notably plutonium). The fission products are the most radioactive and have the shortest half-lives. Uranium and plutonium have longer half lives but are less radioactive SNF goes from reactor to interim storage anywhere from 20-40 years. Interim storage typically consists of putting nuclear wastes into large pools of water. The water cools the radioactive isotopes and shields the environment from the radiation. After the cooling off period the high level of waste will either be reprocessed or directly disposed. Much of the uranium and plutonium can be reprocessed and recycled as fuel to power the nuclear reactor. What cannot be salvaged will be disposed of indefinitely due to the large amounts of time that it takes for some of the waste isotopes to decay. The disposal system consists of surrounding the packaged solid waste and prevent it from moving leaking into the environment. The packaging is typically a copper canister with a cast iron insert. The second layer consists of bentonite clay and is used as a buffer. It will protect the canister from any small movements. The last step is to place these into several hundred meters of rock. The rock stops the leaking of the material into the environment as well as to protect the canister and offer a stable environment. Currently no country has a complete system for storing high level waste but many have plans to do so within the next 10 years. Phenomenal Energy Output - The energy produced from fissionable material like Uranium-235, is approximately 10 million times the energy obtained by burning same mass of coal. Relatively Low Operating Costs - Once built, a nuclear power plant is not an expensive energy source to fuel and operate. Nuclear technology is readily available- It does not have to be developed first, eliminating costs. Nuclear Power Generation emits very low amounts of CO2 - The emissions of green house gases and therefore the contribution of nuclear power plants to global warming is relatively little. A Reliable Energy Source - Nuclear energy is a comparatively reliable energy resource, unaffected by strikes and shortages around the world, as very little is required at a time and its well distributed around the world. Safety- This can be looked at as a pro or a con. The results of a compromised reactor core can be catastrophic, however, the precautions and safety measures taken by the manufacturers of these facilities as well as the regulatory agencies are extremely redundant and prevent accidents very well. Statistically, nuclear power is one of the safest methods of producing energy. For more information regarding expectations of nuclear energy look here or for the economics of nuclear power look here. Time and Costs - The time frame needed for formalities, planning and building of a new nuclear power generation plant is very lengthy. Also, the costs associated with constructing a nuclear plant are extremely expensive. Nuclear Meltdowns and Disasters - A nuclear meltdown occurs when there is an acute shortage of coolant water in the nuclear reactor. This can lead to disastrous consequences, harming humans as well as the environment. The Chernobyl accident of 1986 is a constant reminder of the devastation of radiation in the event of a meltdown. Radioactive Waste Disposal - The safe disposal of radioactive waste is a major problem. Fission of a material like Uranium leaves by-products, which are themselves radioactive and highly harmful to the environment. Storage facilities are not sufficient to store the world’s nuclear waste, which limits the amount of nuclear fuel that can be used per year. Preferred Terrorist Attack Target - A terrorist attack on a nuclear power plant similar to the attacks on 9/11 could have worldwide catastrophic effects. The EPR Reactor plants designed by companies such as Areva NP are intended to withstand commercial and military aircraft attacks. A Catalyst for Nuclear Weapons Creation - There is no guarantee that fissionable nuclear fuel supplied to a country will not fall in to the wrong hands and be used to produce weapons of mass destruction like atomic bombs and hydrogen bombs. Read further in depth on the accident risks in Fossil, Hydro, and Nuclear Energy Chains here. In 2008, the United States produced 74.23 quads of energy with nuclear energy being the 4th leading fuel to produce energy ranking after Petroleum, Dry Natural Gas, and Coal. The processes tied to nuclear energy were responsible for 8.46 quads of energy produced. The U.S. Energy consumption for 2008 was 100 quads or 1 quadrillion British Thermal Units with energy consumption as a result of the nuclear energy processes being 8.46 quads or 8.46% of the total energy consumption. This consumption level was enough to place nuclear energy as the fourth leading domestic source of energy consumed in the United States. In 2008, the United States had to import 25.99 quads of energy to close the gap between the amount of energy they produced domestically and the amount of energy that was consumed by Americans' throughout the year. The vertical axis of the graph below is energy production measured in quadrillion BTU. That begs the question can nuclear power be counted on to produce a larger portion of the energy consumed yearly in the United States? And if so, How long would it take to reach that level? The obvious way for Nuclear Power to see an increased importance in production of energy in the United States is to be used as a greater contributor of electricity. Since 2004, the United States has used approximately 4.0 x 109 Megawatt hours (MWh) of electricity with the United States consuming 3.95 9 MWh of electricity in 2009. Of that number, Nuclear was responsible for 7.99 x 108 MWh or 20.3% of all electricity. Due to the present concern about greenhouse gases, the United States and countries around the world have begun looking into energy producing technologies that minimize or even eliminate carbon dioxide (CO2)emissions. Nuclear power falls into this category since it emits a trace amount of CO2. Is increasing production from nuclear energy a viable candidate to help reduce the current problems with CO2 emissions? If so, at what cost? When discussing costs and estimates of any project there is always more than one. It is no different when discussing nuclear energy. There are estimates on the low end such as the study performed at the University of Chicago and funded by the U.S. Department of Energy and there are estimates significantly higher than that such as the estimate made by Craig Severance in his study titled “Business Risks and Costs of New Nuclear”. Generating capacity may be the biggest hurdle as nuclear power plants operate on a daily basis at 90% of their total operating capacity meaning that any increase in energy production would have to be done through the creation of new power plants. This increase in generating capacity caused a spike in power generation equivalent to the construction of new power plants. U.S. electricity demand is projected to rise 28 percent by 2035. Maintaining nuclear energy’s current 20 percent share of generation would require building about one reactor per year starting in 2016, or 20 to 25 new units by 2035. Read further in depth at the U.S Energy Information Agency. The cost of Uranium is one of the main positive aspects of switching to a more invasive nuclear program. The current fuel cost associated with Uranium is less than $.005/kWh. To further enhance this aspect is the fact that an increase in the price of uranium will only have a minimal effect on the $/kWh. For Example, the doubling of the price of uranium will only increase the price/kWh from $.005 to $.0062 or an increase of 24% while doubling the cost of coal will cause the price/kWh to rise 31% and the same move in gas prices will cause an increase in price/kWh of 66%. Only if the price of Uranium rises above $100 for a prolonged period of time will the fuel cost associated to nuclear suffer. Severance estimates the cost of fuel to be $.03/kWh. This estimate, however, includes all costs tied to the fuel from the time it is mined until the time it is disposed. The cost of enriching the uranium, disposing of the uranium and other miscellaneous costs tied to the use of uranium during the nuclear process. The study by the University of Chicago which was funded by the US Department of Energy, compared the levelized power costs of future nuclear, coal, and gas-fired power generation in the USA. Various nuclear options were cover, and for an initial ABWR or AP1000 they range from $.043/kWh to $.05/kWh on the basis of overnight capital costs of $1200 to $1500/kW, 60 year plant life, 5 year construction and 90% capacity. Coal gives $.035/kWh to $.041/kWh and gas gives $.035/kWh to $.045/kWh depending greatly on the fuel price. The levelized cost figures in the table above include up to 29% of the overnight capital cost as interest, and the report notes that up to another 24% of the overnight capital cost needs to be added for the initial unit of a first-of-a-kind advanced design such as the AP1000 from Westinghouse. However, the Severance study estimated capital costs for new nuclear energy to be in the neighborhood of $.17/kWh to $.22/kWh. The increase can be seen in Severance's inclusion of decommissioning costs, property tax and waste costs. To see all of the math behind the go to the Severance study posted above. Another potential cost savings can be found in a lower CO2 emission per kWh. As seen in the table below a nuclear power plant emits approximately 10 times less emissions than a coal fired power plant. The picture below illustrates the total combined costs of the major power producers. The numbers are on the basis of 91% capacity factor, 5% interest rate, and 40 year plant life. Further information regarding the cost analysis can be found at the World Nuclear Association. The need for land is not a problem for nuclear power. Current power plants only use approximately 2 square miles. The U.S. could accomodate the current electricity demands in the U.S. and only have a footprint the size of the state of Delaware. The U.S. would need to have 512 nuclear power plants to accomplish this feat. So is nuclear the answer the U.S. problem regarding CO2 emissions? 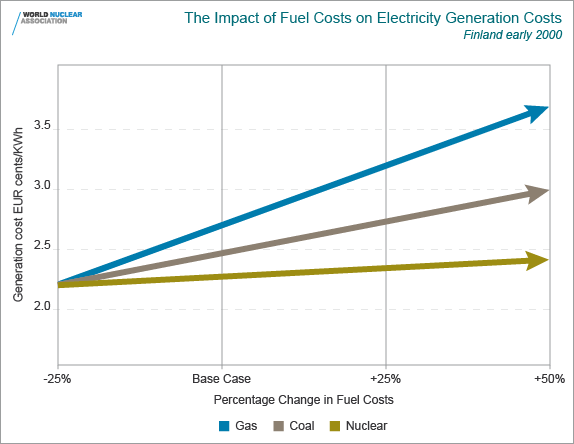 At first glance it would appear it could be difficult to determine what study of the cost of nuclear energy to believe. However, this can be decided by looking at the costs associated with many of the newest proposed plants. The reported price of six pressurized water reactors set to begin building in 2008 can shed some light on the situation. Of the six reactors, the lowest estimated capital cost was $2,444 with the highest being $5,144. It appears that Severance's numbers are closer to the current cost environment surrounding the construction of nuclear power plants. With the U.S. needing to build an additional 20 to 25 plants by 2035 just to maintain their share of an increasing United States energy consumption it does not appear likely that nuclear will be able to bite off a bigger piece of the energy consumption pie. Currently there are four nuclear reactor manufacturing companies with operations and reactor technologies in the United States. Each of these companies also offer a wide range of nuclear products and services. These companies are: GE Hitachi Nuclear Energy, Westinghouse, AREVA NP,Asea Brown Boveri/Combustion Engineering*. (ABB’s nuclear power business was acquired by BNFL in 2000 and was merged into a BNFL subsidiary, Westinghouse Electric Company.) The primary technological focus of each company is their Generation III+ reactors which are relatively similar in function, but each has its own unique design and features. 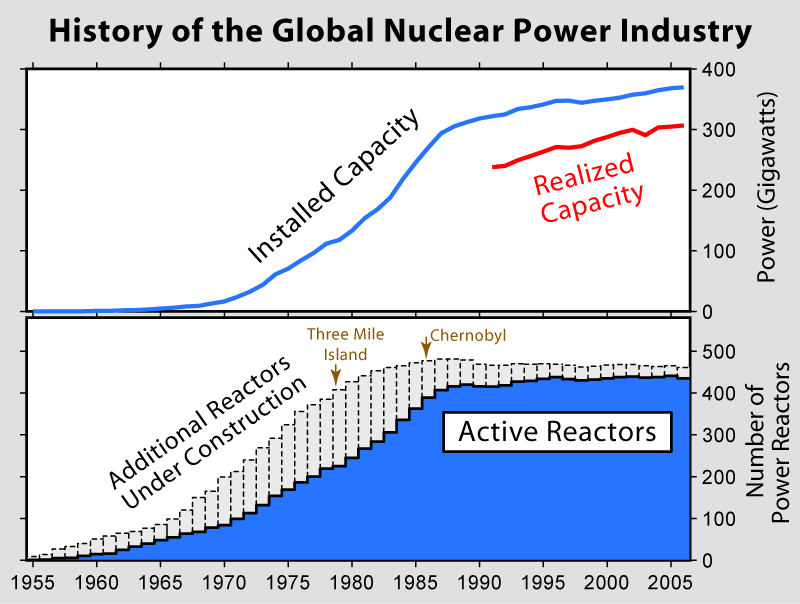 A generation III reactor is a development of any of the generation II nuclear reactor designs incorporating evolutionary improvements in design developed during the lifetime of the generation II reactor designs. These include improved fuel technology, superior thermal efficiency, passive safety systems and standardized design for reduced maintenance and capital costs. This efficient design helps make the AP1000’s footprint noticeably smaller than typical reactors. The AP1000 is projected to produce a net 1154 MWe. The AP1000’s simplified design saves money and time with an accelerated construction time period of approximately 36 months, from the pouring of the concrete to the loading of the fuel. GE Hitachi Nuclear Energy has provided advanced technology for nuclear energy for over five decades. They divide their product lines into three categories: advanced reactor technologies, nuclear services, and nuclear fuel cycle. GE Hitachi is recognized as the world’s foremost developer of boiling water reactors. One such reactor is the EBSWR or Economically Simplified Boiling Water Reactor, whose design is simple yet very effective. This reactor employs Passive Safety Design features similar to those of the Westinghouse AP1000. The passively safe characteristics are mainly based on isolation condensers, which are heat exchangers that take steam from the vessel or the containment (passive containment cooling system, PCCS), condense the steam, transfer the heat to a water pool, and introduce the water into the vessel again. This means that all residual heat is transferred to the atmosphere. The ESBWR design reduces 25% of pumps, valves, and motors from previous designs and it has a referenced construction schedule of 42 months. The ESBWR uses natural circulation with no recirculation pumps or their associated piping, thereby greatly increasing design integrity and reducing overall costs. The ESBWR is currently in the U.S. design certification process unlike the AP1000 which is the only Generation III+ reactor to have received design certification in the United States. The nominal summertime output of an ESBWR is rated at 1575-1600 MWe. One single ESBWR, replacing the same amount of electricity generated through traditional sources, would reduce greenhouse emissions by an amount equivalent to taking 1.5 million cars off the road. Areva is a French public multinational industrial conglomerate mainly known for nuclear power. Areva is the only company with a presence in each industrial activity linked to nuclear energy: mining, chemistry, enrichment, combustibles, services, engineering, nuclear propulsion and reactors, treatments, recycling, stabilization, and dismantling. Areva is known for their EPR or European Pressurized Reactor. The EPR has been designed to meet extremely high safety criteria. It is resistant to external hazards due to a sturdy concrete shell that can withstand commercial or military airplane impacts. The reactor building's dual-wall containment and a specific compartment isolate the core perfectly in the event of a meltdown accident. Safety is enhanced through a quadruple redundant safeguard system. The EPR reactor is a 1,650 Mwe pressurized water reactor and Areva has mastered it perfectly: they have built 87 pressurized water reactors in 11 countries of which 84 are still in operation. Areva’s EPR reactor is the first Generation III+ pressurized water reactor design currently being built ( four currently under construction) to answer the world's growing demand for clean and reliable electricity generation. Under construction in Finland, France and China, the EPR reactor is also being considered by the United States, United Kingdom, India and other countries for the development of their nuclear fleet. Areva announced in March 2010 the design of a new reactor type capable of breaking down actinides created as a product of nuclear fission. ABB is the world's largest builder of electricity grids and is active in many sectors, its core businesses being in power and automation technologies. ABB is one of the largest engineering companies as well as one of the largest conglomerates in the world. Up until the sale of ABB’s nuclear power business in 2000 they produced and advanced pressurized water reactor known as the System 80+. When ABB was merged into Westinghouse, the companies combined technology. Today, ABB still designs and produces qualified nuclear applications such as Electromechanical relays, Generator Circuit Breakers, and Robotic cleaners. Their generator circuit breakers such as the HEC-7C are technologically superior to all other manufacturers and have the world's highest short-circuit current capabilities. Suitable for the largest power plants, the HEC 7/8 has been developed as a system to be used in nuclear, coal fired and hydro power plants. All of these technologies are currently used in nuclear power plants and reactor stations around the world. ABB's HEC-7C Generator Circuit Breaker at Brown Ferry Nuclear Power Plant. Most reactors on order or planned are in the Asian region, though there are major plans for new units in Europe, the USA and Russia. Significant further capacity is being created by plant upgrading. Plant life extension programs are maintaining capacity, in the US particularly. The newest plants in the U.S. are the following 5. It is TVA energy company's third nuclear power plant. Located on 1,700 acres on the northern end of Chickamauga Reservoir, in east Tennessee.The plant was named for a sandbar at Watts Island that hampered navigation on the Tennessee River until it was flooded by Watts Bar Reservoir. Groundbreaking on Watts Bar Nuclear Plant occurred in 1972, with major construction beginning a year later. Unit 1, the last commercial nuclear unit in the United States to come online in the 20th century, began commercial operation in May 1996. It iscapable of producing 1,170 megawatts of electricity, enough to serve 650,000 homes. In its 13 years of safely generating electricity, Unit 1, with an operating capacity factor of 95 percent, has produced more than 112 billion kilowatt hours of electricity. (About 8.6 billion kw hours of electricity a year. About 620 TVA employees help ensure the safe and reliable operation of Watts Bar Unit 1. Construction of the two Westinghouse pressurized water reactors began in 1974. Unit 1, originally rated at 1,084 MWe, came online on April 17, 1990. Its current, 40-year operating license is valid until February 8, 2030. Unit 2, 1,124 MWe, followed on April 6, 1993 and is licensed to operate until February 2, 2033 when it has to renew its license. As of 2006[update] Unit 2 was the second-last power reactor to come online in the USA, followed only by Watts Bar 1. On June 2008, the Nuclear Regulatory Comission approved a request to increase the generating capacity of units 1 and 2 by approximately 4.5% each. Unit 1 was uprated in autumn 2008 and saw a generating capacity increase from approximately 1,210 to 1,259 MWe and in Unit 2, the capacity rose from an estimated 1,208 to 1,245 MWe, was uprated in autumn 2009. Seabrook Station opened a visitor's center called the Science & Nature Center in 1978. More than 500,000 visitors have toured the center, which offers more than 30 interactive, educational exhibits that focus on nuclear energy and the thriving ecosystem that surrounds the plant. The facility hosts an average of 2,000 to 3,000 students annually on field trips each year. The Limerick Generating Station in Pennsylvania is located next to the Schuyckill River. The facility has two boiling water reactor units, cooled by natural draft cooling towers. When conditions are right, these cooling towers emit enough water vapor to be seen for distances of over 50 miles. The units are capable of producing almost 1,200 megawatts of power each, which combined would provide electricity to over 2 million households.